Join us on May 04, 2019, for A Celebration of Disney: A conference focused on discussing, analyzing, critiquing, and celebrating the multifaceted work of Disney! See a list of our Speakers! 9:00 – Conference opens/registration. 8th floor lobby. 1A. Language and Literature in Disney. 1137. 1C. Women in Animation. 805. 1E. PRINCESS PARTY 1: PRINCESS LESSONS. 804. Learn how to be a royal with lessons from an official princess. This one hour session includes prince/princess lessons and crowns/tiara making to look the part. 2A. Academic keynote: Dr. Rebecca Williams. 806 . 2B. PRINCESS PARTY 2: CRAFT WITH A PRINCESS. 804. Come and craft with a princess. In this one hour session paint a teacup and prepare for the royal tea party. 3A. Disney and Horror. 1137. 3B. Disney Theatrical Productions: Twenty-Five Years of Disney on Broadway. 1140. 3C. How Walt Disney’s Virtual Office Inspired Us* (until 2:00) (VR experience), 802. 3D. Disney and Feminism. 805. 3E. “Pixar and the Craft of Storytelling” Workshop: Scott Myers. 806. 4A. Professional Keynote: Philo Barnhart. 806. 4B. PRINCESS PARTY 3: ROYAL TEA PARTY. 804. Now that you learned how to be a royal, join a princess for a royal tea party. Light snacks and refreshments will be provided. 5A. Disney’s Animated Path to Personhood: To Liberalism and Beyond. 1140. 5B. Fandom and the Disney Industry. 1137. 5C. Disney and the Body. 802. 5D. Love in Disney. 805. 5E. Live Commentary on The Little Mermaid (until 4:15). 806. 5F. PRINCESS PARTY 4: PRINCESS SING-A-LONG AND PHOTO-OP. 804. Sing along to some of your favorite royal tunes with a princess. Once you've sung your heart art pose like a royal and show off your new accessories in a princess photo-op. 6A. Disney: Remixed – Discussion Panel. 1137. 6B. You’re Watching Disney Channel (and ABC). 1140. 6C. Marvelous May the Fourth: Disney Brand Extensions. 802. 6D. Gender in Disney Media. 805. 6F. Self Defense Workshop. 806. 7A. The Disney Theme Park. 1137. 7B. Teaching Disney: Using Disney in the Classroom. 1140. 7C. Seeing the Other in Disney. 802. 7D. Disneybounding: The Show. 805. Academic keynote for 2019’s Celebration of Disney! Dr Williams is Senior Lecturer in Communication, Culture and Media Studies at the University of South Wales. Her work on fandom has been published in journals such as Celebrity Studies, European Journal of Cultural Studies, Transformative Works & Cultures, Continuum, Popular Communication, and Cinema Journal and she is a member of the Board of the Fan Studies Network. She is the author of Post-object Fandom: Television, Identity and Self-Narrative (2015, Bloomsbury) and editor of Torchwood Declassified (2013, I.B. Tauris) and Transitions, Endings, and Resurrections in Fandom (2018, University of Iowa Press). She is currently writing Theme Park Fandom: Distinction, Immersion & Participatory Culture for University of Amsterdam Press. Professional keynote for 2019’s Celebration of Disney! Philo Barnhart is professional film animator living in Oak Park, IL, known for his work on feature-length films: The Little Mermaid, Beauty and the Beast, The Rescuers Down Under, The Secret of NIMH, Happily Ever After, An American Tail, and special effects for Star Trek: The Motion Picture. DePaul Pop Culture Conference is proud to support HDSA through donations, tee-shirt sales, and our annual silent auction. See our other charitable work here. Every year, the DePaul Pop Culture sells tee-shirts to support the charity! This year’s design is by talented artist Sarah Cruz (@trisarahtops_c). 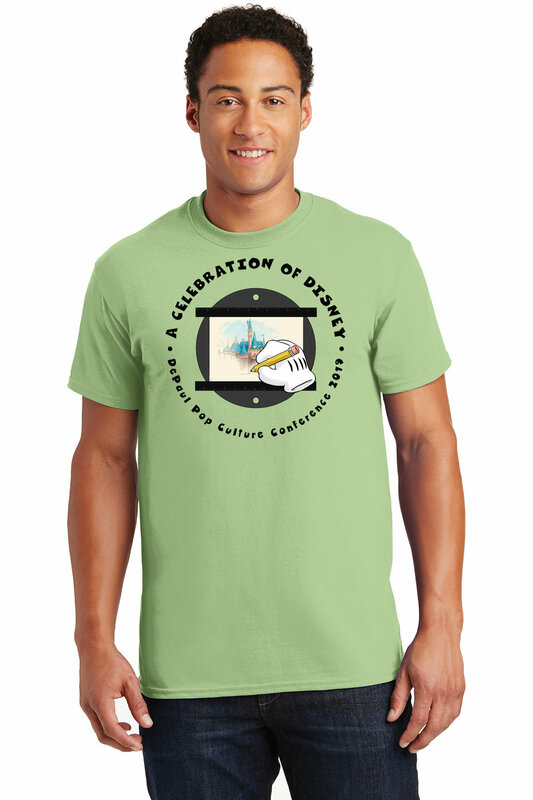 You can pre-order your shirt today (for pickup at the conference) at our online store! (While you’re there, consider donating some extra to Huntington’s Disease Society of America, or getting our conference books!) Teeshirts are not sold at the conference itself so pre-ordering is the only way to get one! The Pop Culture Conference will be held at 247 S. State Street in downtown Chicago (DePaul’s Daley building). The doors will open at 9:00 am and the first panels start at 9:30am. Parking is available downtown at numerous lots and garages. You can use ParkWhiz or SpotHero to book your spot. To book with ParkWhiz, you can use coupon code POPCULTURE to get $5 off parking, or click this link (remember to fill in the correct date/time). To book with SpotHero, please click this link (remember to fill in the correct date/time). 30% of the revenue generated from using SpotHero will be donated to this year’s charity.